Working in a yarn store is just too tempting at times. 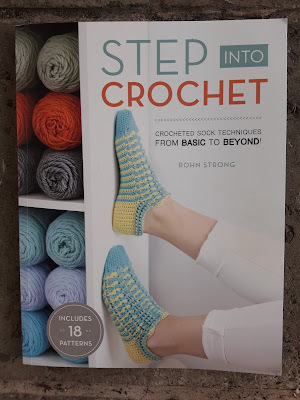 The sweet owner, my boss Chris, knows about my passion for crochet socks so it took me all of three seconds to purchase Step into Crochet by Rohn Strong when she handed me the newly arrived copy. I am a big Rohn Strong fan. I first discovered him last year when I bought his book New Methods for Crochet Socks and this led to me to join his Facebook group Crochet Sock Addicts! I took part in his July sock CAL (crochetalong). And on that CAL I made the first pair of crochet socks that actually fit me. I didn't know before I started trying to crochet socks that I have a wider than average ankle and I had to customize them for my feet. Rohn also has thick ankles and the first pair of socks he crocheted didn't fit him either. He wrote Step into Crochet to help people crochet socks that fit by teaching them "all there is to know about crocheted socks". And the book does just that. There are four chapters covering technique at the beginning of the book before you even get to the patterns. These chapters cover measurement, gauge, sock construction, stitch choice, heels, toes and cuffs and yarn choice. My favorite page has to be "Top five ways to adjust patterns for a custom fit". So helpful for me with my nonstandard feet!! I would highly recommend this book. Rohn told me it took two years to write and he crocheted every single sample. It has taken me three months to design and write up one basic small sock pattern so I'm extremely grateful that he's there sharing all these tips and producing such amazing designs for us!! Have a great week y'all. And leave me a comment about your crochet sock experiences below. I'd love to know! Hoston Fiber Fest is THIS Week!